Tolkien once wrote that "[The Tree of Tales] is closely connected with the philologists' study of the tangled skein of Language," suggesting an intimate and complex symbiosis between creation and philology. In a 1979 essay, Tom Shippey termed this unique generative methodology "creation from philology", and this will be the focus of my talk. I will begin with a series of linguistic roots, then trace out a ramifying tree of interrelated words and meanings in many of the languages of Tolkien's expertise, connecting them to the ever enlarging scope of Middle-earth as I proceed. I will discuss the relationship and etymologies of words like wraith, writhe, worm, ring, among others, attempting to show how Tolkien began with philological ruminations, then followed them from world to world like a trail of breadcrumbs to develop a fictional narrative. From Tolkien's 1922 Middle English Vocabulary to the Nazgûl of The Lord of the Rings, from his 1927 painting Hringboga Heorte Gefysed to the Lost Road into the Uttermost West -- I will attempt to retrace Tolkien's own philological journey "there and back again", pointing out the Wanderwörter, standing like so many linguistic landmarks, along the way. In order to create his own unique mythological, fantastical world in The Chronicles of Narnia, C.S. Lewis drew from many sources, one of the most noticeable of which is classical mythology. This includes the Greek, Roman, and Norse mythical traditions. Lewis's friend and fellow Inkling, J.R.R. 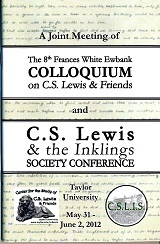 Tolkien, criticized Lewis for drawing on what he considered a disparate hodgepodge of sources for the fantasy world of Narnia. Compared to Tolkien's meticulously crafted Middle Earth, Lewis's Narnia is certainly less extensive in scope. However, Lewis's use of sources like classical mythology and his fusion of multiple traditions make for a rich and layered reading, full of surprises.